I first did the unique artist residency that is Pierre Feuille Ciseaux in 2011, just after the publication of Big Questions. 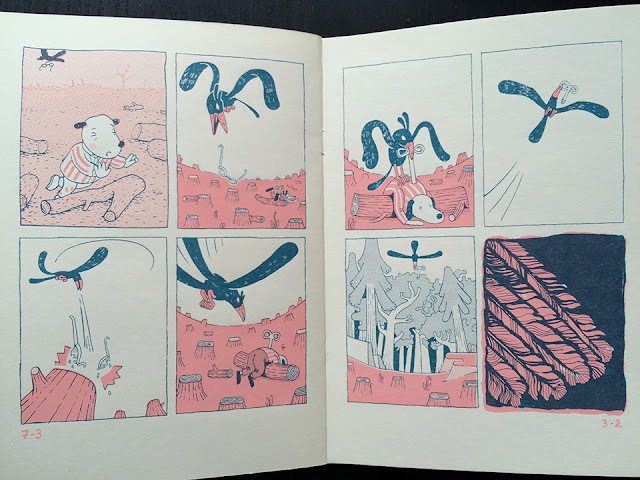 I went to a tiny village in France with 19 other artists from 6 or 8 different countries – almost all complete strangers – and worked on structured collaborative comics experiments for a week. I had no idea what to expect going in, and was probably a little skeptical. But it was amazing. Conceptual comics Summer camp in the best possible way. In 2013 Zak Sally (another 2011 attendee) and June Misserey had the idea to bring PFC to Minneapolis, and I ended up helping make it happen, along with ChiFouMi, Barb Schulz and the Minneapolis College of Art and Design. And again, it worked out better than any of us could have hoped. Well, now it's back. Artists will begin arriving a week from today. June is already on the ground. We've got luminaries like Charles Burns and Jillian Tamaki joining us this year along with experimentalists like Aidan Koch and underground heroes like Laura Park. The full list is below, and it again includes a slew of European artists like Dominique Goblet, Elvis Studios' Helge Reumann and one representative of the lively Mexico City comics scene, Ines Estrada. Every iteration of PFC produces an editioned, hand-made artist's book with contributions from all of the artists. That's true again this year but for the first time we are making the book (screenprinted cover, risograph interior), along with a narrative comics screenprint available to the public. We should have been doing this all along, of course, but this year there was a slight shortfall in funding to bring some of the European artists over, and so our hand has been forced, for the better. So last week we launched a Kickstarter, which functions basically as a presale of the book and print. Go here to find out more, to get a copy, and to give us a hand.